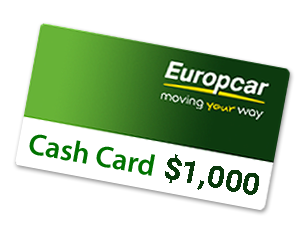 Opt in and book Europcar for your chance to win $1,000! Terms and Conditions Apply please click here for further details. One entry per agent will qualify through the opt-in form. Bookings must be made between 01 April – June 30, 2019 and actualized by July 31, 2019. Only bookings made through a GDS or Click4Wheels will be eligible for this promotion.